the kingdom on the other side. Foldable. Label it as shown. sugars form a netlike structure that is porous and strong. Copyright © McGraw-Hill Education. 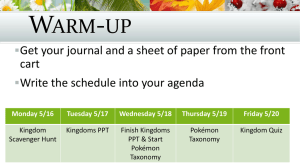 Permission is granted to reproduce for classroom use. on cell type, structure, and nutrition. more abundant than any other organism. that do not have a nucleus or other membrane-bound organelles. What are the characteristics of archaea? of marshes. Little or no oxygen is found in these environments. waters. The water temperatures can reach 98˚C, almost boiling. 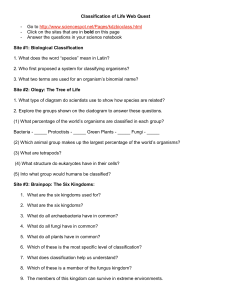 What are the characteristics of Kingdom Protista? 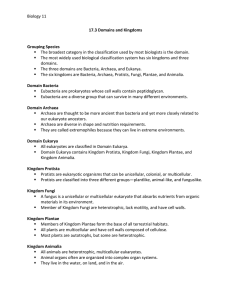 protists, animal-like protists, and funguslike protists. plantlike protists because they perform photosynthesis. 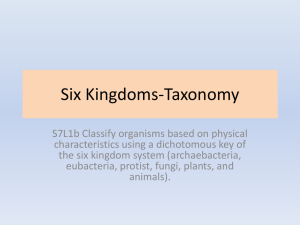 What are the characteristics of Kingdom Fungi? 4. Define What are hyphae? chitin, which is a rigid polymer that gives cells structural support. 70,000 species of fungi have been identified. the nutrients directly into their cells. food from algae that live among the fungi’s hyphae. 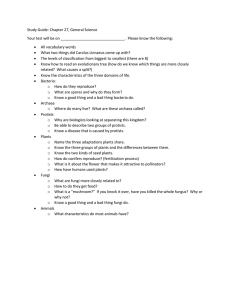 What are the characteristics of Kingdom Plantae? 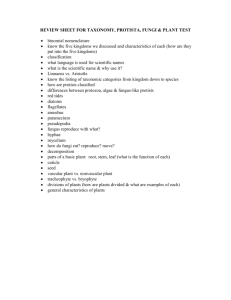 Members of Kingdom Plantae (PLAN tuh) are called plants. Plantae. Plants form the base of all land habitats. plant. It obtains food through suckers connected to the host plant. vascular plants have organs such as roots, stems, and leaves. 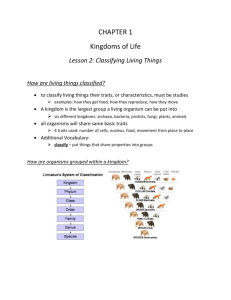 What are the characteristics of Kingdom Animalia? 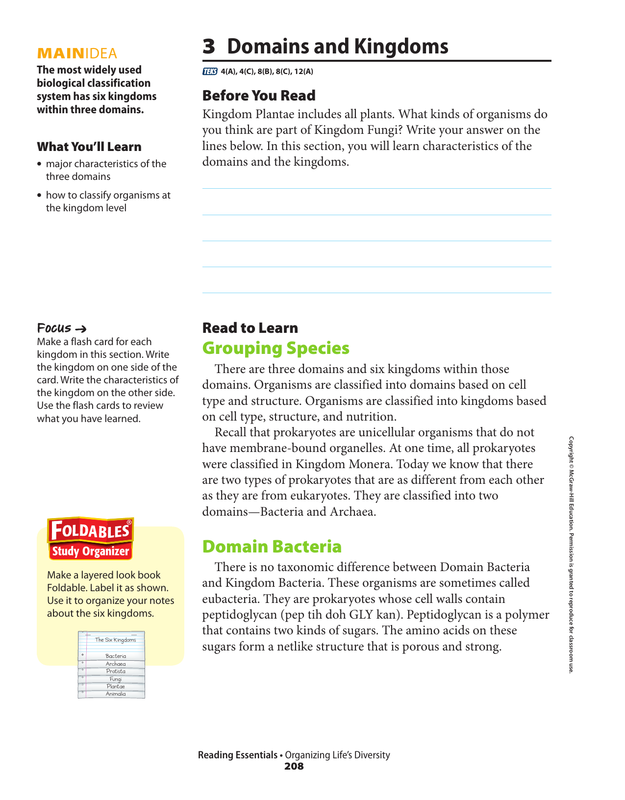 organisms and have membrane-bound organelles. organized into organs such as skin, a stomach, and a brain. such as digestive, circulatory, and nervous systems. Animals range in size from a few millimeters to many meters. 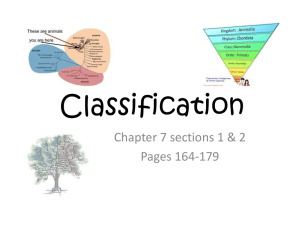 Is there an exception to the classification system? 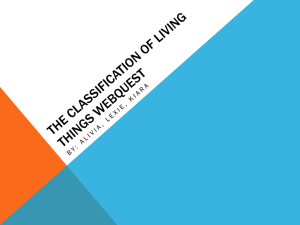 not usually placed in the biological classification system. on a variety of factors. table, think of organisms that fit into each kingdom.